In order to meet the specific requirements of our respected customers, we are providing them personalized Wind Socks. Our Wind Socks are properly indicating relative wind speed and direction. Also, these Wind Socks are extensively used in airports and chemical plants to stop gaseous leakage. Cloth : High quality waterproof polyester strip with lining. Lace On : Two rows of stainless eyelets at ring end for holding superior strength. Webbing Harness : High quality nylon cord about 2 mtr. long. Windsock NPU 5' made from strong & durable nylon nor flat material with Anticorrosive, anti ageing PU coating to increase tear resistance. Combination of Aerodynamic & honeycomb weave makes float all around. No vertical joints makes it seamless & 2 feet dia makes it suitable for all stands, red & white colour combination with eyelets at equal distance & pp rope to tie. - Made from PU coated, nylon, and polyester fabric with polyester lining. - Helps in asserting the wind direction and thus useful in fire fighting, controlling air pollution and a good publicity tool. - Sizes: 2' X 1 ¼' dia X 6' / 8'. - Stand for the Windsock with double ball bearing is available in length as per requirement. 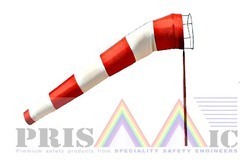 Our company holds specialization in offering customers the best quality range of Safety Windsock.